I was with a group of people, doing a summer programme, and we all got told that we had to come up with a short speech. Normally, topics that get chosen are ones that are so popular in today's world: racism, cruelty, homophobia, religion etc. How is such a concept ignored? These days, the world lacks in kindness. 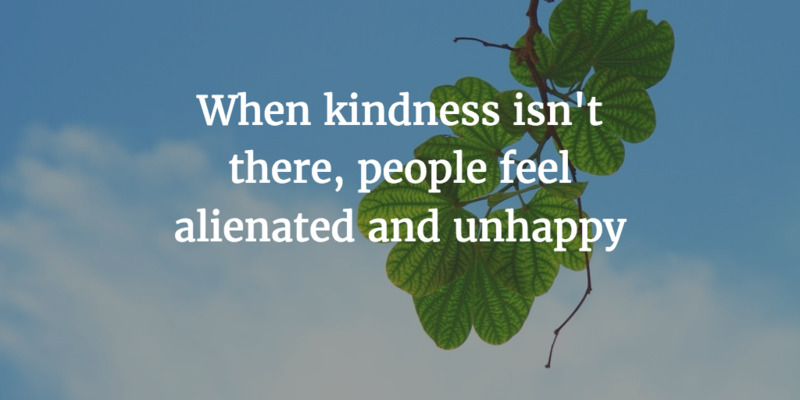 When kindness isn't there, people feel alienated and unhappy. Some people have committed atrocities, simply because they were bullied, (which is course, stems from unkindness), and then this affects many people. You can never know what someone else is going through, and when we start to exchange bitter for bitter, it slowly but surely depletes the world of kindness. It makes me feel sad that in a world of ground-breaking technology and every day discovery, that we cannot even be nice to one another without feeling uncomfortable or strange. Being kind makes you feel good, and it reflects well on you as a person. So, do yourself and the world a favour, and be kind to everyone.